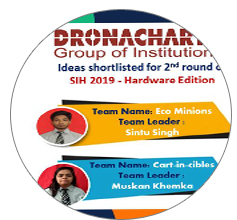 Two Ideas: Team “Eco Minions” of Sintu Singh and Team “Cart-in-cibles “of Muskan Khemka shortlisted for 2nd round of Smart India Hackathon 2019 - Hardware Edition. 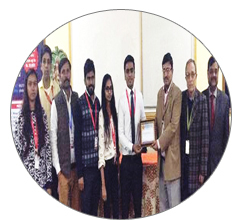 Navonil Das student of CSE Department won First Prize of Rs 8000 in programming competition ‘Techwave- 2019’ organized by uCertify Training & Learning Pvt Ltd on 2nd March 2019 to recognize and reward champion coders. Sh. 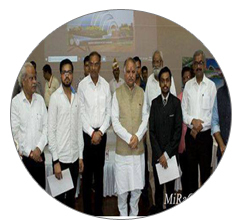 Yogi Adityanath (Honorable Chief Minister Uttar Pradesh) awarded Utkarsh Singhal student of IT branch during felicitation ceremony “Pravadhik Shishka: Safalta ke Naye Aayam” held at AKTU Lucknow on 22nd February 2019 for the Mars Mission India Project (MMI-6) under MINAR (Mine Analog Research Program) held at Whitby, Yorkshire organized by University of Edinburgh.(U.K). 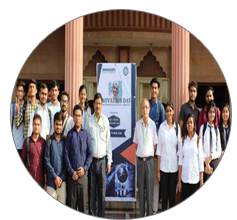 Two teams from DGI qualified as the Finalist of NES Innovation Awards 2019 instituted under the patronage of Padma Vibhushan Dr R. A. Mashelkar, the celebrated former Chief Scientific Advisor to the Govt of India and Founder of the Pune International Center was organized on February 23, 2019 at Sumant Moolgaokar Auditorium, Pune. Two teams from DGI qualified for the State Level Competition by winning the Zonal Level in Dr. Abdul Kalam Technical, Literary & Management Fest 2018-19 organized by Center For Advanced Studies, Dr. A.P.J. 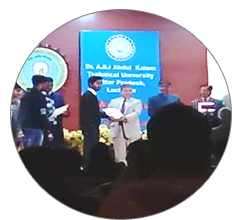 Abdul Kalam Technical University-Lucknow on 15th – 16th February 2019. 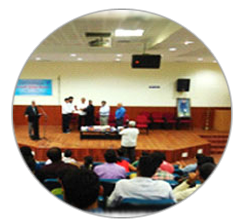 Students of CSE Department won the Second Prize and received a cash award of Rs. 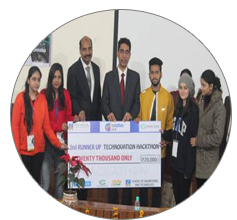 20,000 in Technovation Hackathon 2019 organized by Greater Noida Industrial Development Authority (GNIDA) on its 28th Foundation Day during 25th – 28th January 2019. 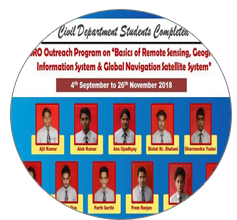 Civil Department students has successfully completed IIRS-ISRO Outreach Program on “Basics of Remote Sensing, Geographical Information System & Global Navigation Satellite." during 4th Sept to 26th Nov 2018. Students of ME Department won the First Prize in Innovation Day celebration organized by DGI-MHRD Innovation Club on 15th October 2018, to mark the 87th Birth Anniversary of Former President of India and renowned Missile Scientist, Dr. Avul Pakir Jainulabdeen Abdul Kalam. 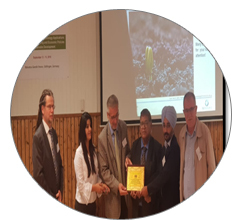 Simran Saluja student of civil department presented the paper in 10TH International Seminar on Harnessing Science and Technology Application through Capacity Building and Economic Policies for Sustainable Development organized by IFSDAA in Collaboration with University of Applied Science and Arts, at Mahatma Gandhi House, Germany from 13th to 15th September 2018. 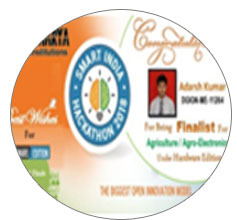 Adarsh Kumar (ME) selected as finalist of Smart India Hackathon 2018- Hardware Edition in Agriculture / Agro-Electronics Theme. 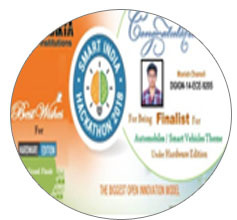 Manish Chamoli (ECE) selected as finalist of Smart India Hackathon 2018- Hardware Edition in Automobiles / Smart Vehicles Theme. 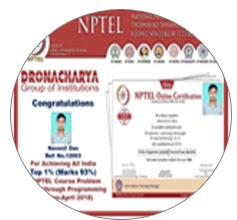 Navonil Das Student of APS Department Achieve All India Top 1% (Marks 93%) in NPTEL Course. 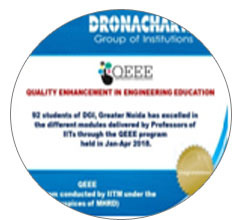 Students excelled in QEEE program held in Jan-Apr 2018. 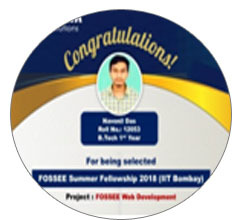 Navonil Das Student of APS Department selected for FOSSEE Summer Fellowship 2018 (IIT Bombay). 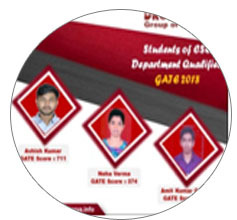 CSE Department Students Qualified GATE 2018. 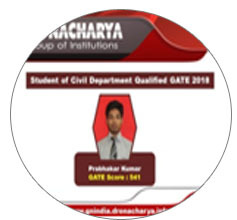 Civil Department Student Qualified GATE 2018. 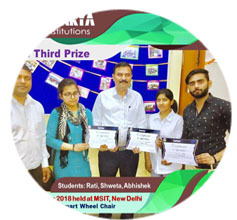 Rati, Shweta and Abhishek Students of DGI won third Prize for Project “Smart Wheel Chair” in Project Exhibition 2018 held at MSIT, New Delhi on 10th March 2018. Two Projects SAAKSH Speech to speech Conversion and High Discharge Hand Pump of DGI students selected under CST UP Engineering Students Project Grant Scheme by Council of Science and Technology, UP DST, Govt. of UP. Mainak Pakira student of ECE Department won First prize for Project : “Bin Bot” in Disruptive Business Category and Runner up in Over All with a cash Prize of Rs.50000 in Accenture Innovation Challenge 2018 held on 27th -28th November 2017. 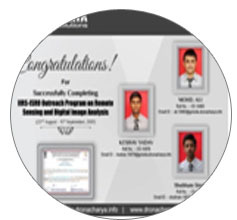 DGI Students Completed IIRS-ISRO Outreach Program on Remote Sensing and Digital Image Analysis. 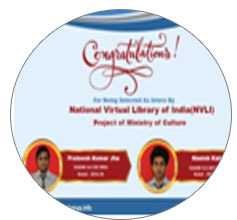 DGI Students selected as Intern by National Virtual Library of India (NVLI). 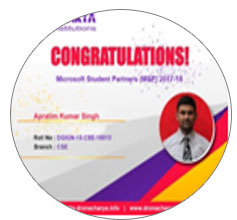 Apratim Kumar Singh Student of CSE Department selected as Microsoft Student Partner. Project tittled “Low cost 3D Printer and CNC PCB Plotter” of Divyansh Negi, Student of ECE 2nd Year won second prize and Cash Prize of Rs. 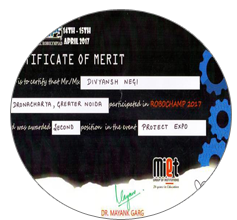 3,100/ in National Level Robotic Championship “Robochamps – 2017” organized by MIET, Meerut, Uttar Pradesh on 14th – 15th April 2017. Project titled “Bin-Bot” of DGI Students selected in Top 5 Projects and Win a cash Prize of Rs 10000/- in Dr. Pradeep P. Thevannor Innovation awards- 2016 held on 9th & 10th February 2017. 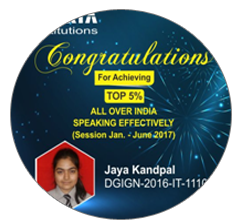 B.Tech First year IT student - Jaya Kandpal, DGIGN-16-IT-11109 has scored 80% in NPTEL course, Speaking Effectively for session Jan – Jun 2017 and is amongst top 5% all over India. 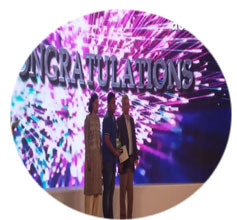 Project titled “IOT Based Health Care System” (Projectee: Saurabh Jiwal (ECE), Sachin Kumar Verma (ECE), Jatin Gupta (CSE) and Lalit Mohan Gupta (EEE)) won the Young Innovator Award during the Innovation Summit, Melting Pot 2020, held at Taj Vivanta Surajkund on 24 and 25 November 2016. Sachin Kr. 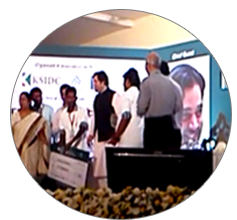 Verma & Rishabh Kesarvani student of ECE Department won Second Prize with a cash reward of Rs.50,000/- for their Project "Hand Talk" in Motorola Scholar Awards Program 2015-16 organized on 16th June 2016 at Bangalore. 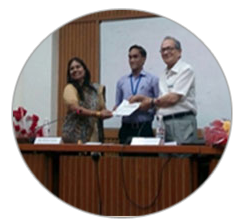 Shiva Chauhan student of ME Department receiving best paper award for “Efficient Mechanical Rickshaw” in 4th International Conference on Science, Technology and Management (ICSTM-16) held on 15 May 2016 at India International Centre, New Delhi. 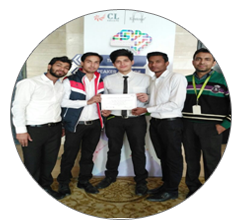 Aakashdeep Chaudhary & team of VI Sem ME students won First Prize for their project, “Sensor based Parking System” in Science Expo, INNOVISION 2016 held on 10th March, 2016 at NSIT, New Delhi. 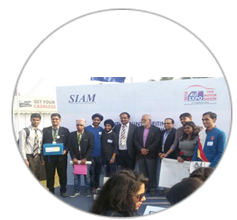 Project titled “Self Destructible Packaging Design for Anti-Counterfeiting” (Projectee: Naveen Purohit, Rohit Kumar and Tapan Singh of ME VI semester ) won the runner up prize in Packaging Design Competition organized by Society of Indian Automobiles Manufactures (SIAM) at Auto Expo 2016, IEML, Greater Noida on 5th February, 2016. 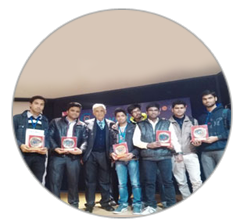 Three projects, “Sensor based automatic targeting system”, “Handtalk controlled wheel chair” and “Gesture controlled wheel chair” from ECE Department and two projects, “Modified double cylinder handpump” and “Voice controlled wheel chair” from ME Department has been awarded Trophies & certifications in Innovation Festival 2016 on 24 Jan 2016 at Pragati Maidan, New Delhi. 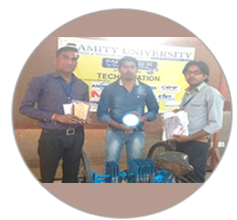 Ritesh Rai, Shiva chauhan, Pradeep Prasad and Rohit Karotia of ME Branch won first prize for their project, “Efficient Mechanical Rickshaw” in the event organized by Amity University on 18 March 2016. Two Projects "Modified Double Cylinder Hand Pump" (Projectee: Student of ME V Sem and VII Sem) and "Efficient Mechanical Rickshaw" (Projectee: Student of ME VII Sem) has been selected for UPP Mini Project (IEEE) funding on 28 September 2015. 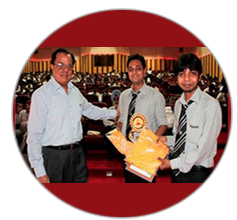 Rikanshi Joshi and team of CSE-IV Sem claimed first prize of Rs. 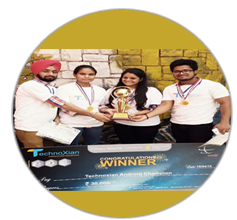 30,000/- at Technoxian 2015 held at IIT Delhi from 17-19 Apr 2015. 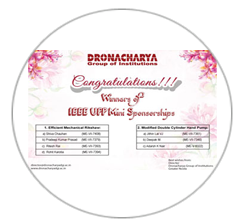 Ankit Soni & Vaibhav Gupta from CSE-VIII Sem claimed first prize of Rs.21000/- at Vivekanand Institute of Technology, Jaipur for their project “Intelligent Helmet” held on 15 Sep 2014.